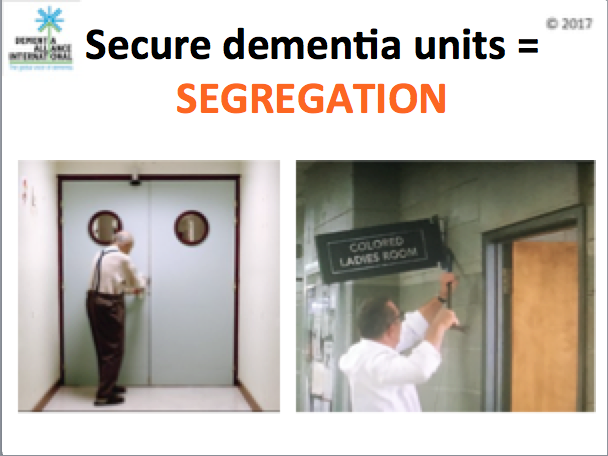 After watching the movie Hidden Figures on a flight few weeks ago, I took a photo of one of the scenes, as per the image here of a power point slide which is being used in almost all of my presentations now, to highlight the fact we are segregating people with dementia by locking them into secure dementia units. This is (should be?) against the law, and is 100% a breach of human rights. Many state it is being done for their or others safety, but it is being done, with no thought of human rights, to make it easier for staff to ‘manage’ them. Frankly, people with dementia would more often get better treatment in a real prison. Fresh air every single day, a gymnasium, their own televisions, and for most, things to do to take away the boredom of each day. Many in prison even take up formal studies. I made a comment to an online friend (past RN in Aged care) on twitter about one ‘distressed’ comment from a person in the audience at a Melbourne conference who rather aggressively ‘bit my head off’ about some of the things I was saying during my presentation. example of overcoming Jim Crow laws to advance NASA program. Sharp parallels to persons with dementia being marginalized. another reason for persons with dementia to band together.